is an international school of art and Italian culture that has organized in Florence, for many years, both short and long art courses for students from all over the world. Our highly professional and architecturally fascinating art studio is situated in the city center of Florence, next to the Duomo and all of the main museums and monuments of the city. The studio was structured according to the concept of “open space” and allows students enrolled in the various subjects to communicate and interact amongst themselves, while at the same time creating a real and typical artistic community. Students come from every corner of the world to study and learn the various techniques. They develop their artistic talents and aesthetic knowledge while also finding their own way in the vast and fascinating world of visual arts. Furthermore, conferences and exhibitions are continuously organized in our school’s center in order to facilitate the understanding and the introduction of our students into the world of Florentine art. 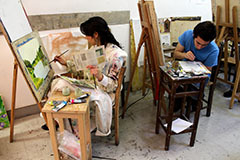 Throughout the year, the school offers courses in drawing, painting with old techniques, painting with modern techniques, sculpture, ceramics, fresco painting, mosaics, fashion design, restoration, engraving, history of art and photography. The courses are also open to beginners. The courses are divided into Basic Courses (6 hours per week), Semi-intensive Courses (10 hours per week) and Intensive Courses (20 hours per week). Basic and Semi-intensive Courses are mainly attended by those taking Language and Italian Culture courses. Intensive Courses instead are for those mainly interested in artistic fields. All art courses can be attended as private lessons (one teacher + 1 or 2 students). Lessons are taught in Italian and English. A certificate is given to participants at the end of the course. Courses begin every week. Art courses are mainly held in the afternoon, Monday to Friday, from 3 p.m. to 7 p.m. with the exception of the Printmaking course that is held in the morning from 9 a.m. to 1 p.m.
Students can take private lessons only in the morning. Italian language courses are held in the morning from 9 a.m. to 2 p.m.